The University of Maryland, College Park, is a public research University and flagship campus of the University System of Maryland. The University advances knowledge, provides outstanding innovative instruction, and nourishes a climate of intellectual growth in a broad range of disciplines. 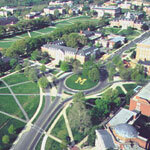 Founded in 1856, the 1,500-acre campus is located along the Baltimore-Washington, D.C. corridor. Over 35,000 students are enrolled in 111 majors.